What Are The Basic County Functions? County administration takes the forms of "County Court" with a Judge and two commissioners, "Board of County Commissioners" with three commissioners, and "Home Rule Charter" with a Board of County Commissioners of what ever is specified by the Charter. Siuslaw County would start as a "County Court" with the Judge having the default duties of misdemeanors and probate. Many counties that transferred the judicial responsibilities (misdemeanor/probate) to the State voiced their regret in the loss of local control over how their troubled youths and minor offenders were treated. Siuslaw County will likely be administered under the form of "County Court" having an elected Judge with misdemeanor/probate functions kept local. Lane County, one of nine with Home Rule Charters, with a population of 350,000 plus, with the size of Connecticut; may need its huge and overbearing bureaucracy. With only 5% the population and 10% the land area, Siuslaw County will operate easily and efficiently under the common County Court form. Being a new county, it will also start without the burden of 160 years of sometimes bad decisions Lane County labors under. One decision Siuslaw County can make is not to use PERS in the compensation package it offers its workers. Then Lane County has five commissioners whose combined salaries, pensions, benefits, expense accounts, office and staff, etc. cost the Lane County people $1,000,000 (one million) per year. Lane County also has an expensive full-time County Administrator, a possition that encouraging staff self-interest over those of the people. Some counties use the judge and two commissioners as part or full time department heads eliminating the issues with county administrators. And counties may add all sorts of optional social programs, can adopt fairgrounds and event/sports centers, operate various business enterprises, and in general far exceed it basic legal obligations. Some county departments/programs are paid by State/Federal funding, some are self supporting through fees and fines, some rely on property and business taxes, some by private/public grants, and then many by volunteers. 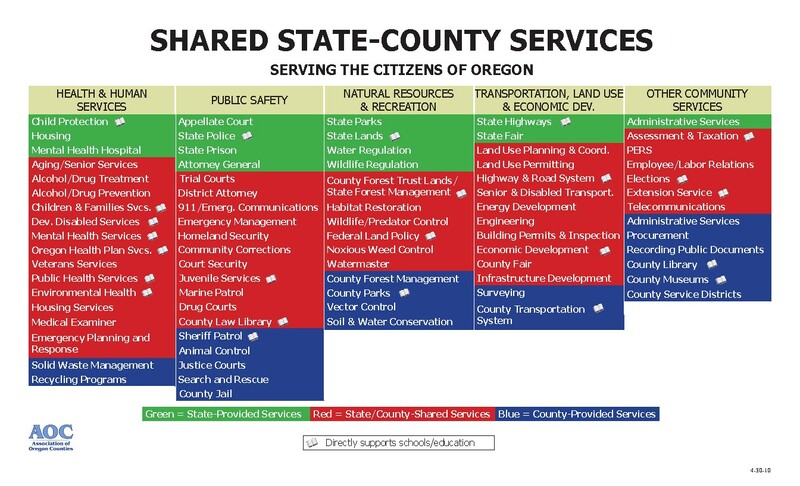 The Association of Oregon Counties created a simple table showing the County/State individual/shared functions.